The Alexander Mosaic, dating from circa 100 BC, is a Roman floor mosaic originally from the House of the Faun in Pompeii, that is allegedly an imitation of Apelles' painting. 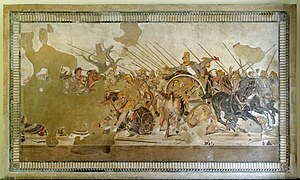 It depicts a battle between the armies of Alexander the Great and Darius III of Persia and measures 2.72 by 5.13 metres (8 ft 11 in × 16 ft 10 in). The original is preserved in the Naples National Archaeological Museum. The mosaic is believed to be a copy of an early 3rd-century BC Hellenistic painting. The mosaic illustrates a battle in which Alexander faced and attempted to capture or kill Darius. Alexander defeated him at the Battle of Issus and two years later at the Battle of Gaugamela. The work is traditionally believed to show the Battle of Issus. Since the mosaic emulates the appearance of a painting so accurately, it has been uniformly agreed that the mosaic is a copy of an original Hellenistic Greek painting. The mosaic is held to be a copy either of a painting by Aristides of Thebes, or of a lost late 4th-century BC fresco by the painter Philoxenus of Eretria. The latter is mentioned by Pliny the Elder (XXXV, 110) as a commission for the Macedonian king Cassander. Despite being damaged, the two main figures are easy to recognize. The portrait of Alexander is one of his most famous. Alexander's breastplate depicts Medusa, the famous Gorgon, and his wavy hair is typical of royal portraiture as established in Greek art of the fourth century BC. He is portrayed sweeping into battle at the left, on his famous horse, Bucephalus, and focusing his gaze on the Persian leader. Darius is shown in a chariot. He seems to be desperately commanding his frightened charioteer to flee the battle, while stretching out his hand either as a mute gesture to Alexander, or possibly after throwing a javelin. He has a worried expression on his face. The charioteer is whipping the horses as he tries to escape. The Persian soldiers behind him have expressions of determination and consternation. Darius's brother Oxyathres is also portrayed, sacrificing himself to save the King. Radical foreshortening – as in the central horse, seen from behind – and the use of shading to convey a sense of mass and volume enhance the naturalistic effect of the scene. Repeated diagonal spears, clashing metal, and the crowding of men and horses evoke the din of battle. At the same time, action is arrested by dramatic details such as the fallen horse and the Persian soldier in the foreground who watches his own death throes reflected in a shield. The mosaic is made of about one and a half million tiny colored tiles called tesserae, arranged in gradual curves called opus vermiculatum, (also known as "worm work," because they seem to replicate the slow motion of a crawling worm). The color scale of Roman mosaics are extremely rich in gradation. The process of gathering materials for mosaics was a complex undertaking since the color scale was based solely on the pieces of marble that could be found in nature. The mosaic is an unusually detailed work for a private residence and was likely commissioned by a wealthy person or family. The fact that this scene was made to be viewed in the house of a Roman civilian reveals that Alexander the Great was more than just a heroic image to the Romans. Because Roman leaders followed after Alexander's image, Roman civilians also aspired to emulate the power he represented. Since the mosaic was arranged on the floor where the patron could receive guests, it was the first decorative object a visitor would see upon entering that room. The mosaic was rediscovered on October 24, 1831, in Pompeii, and was moved to Naples in September 1843, where it is currently preserved on a wall (not on a floor as it was found) in the Museo Archeologico Nazionale. The mosaic is featured on 1,000 Greek drachma banknotes from 1956. In 2003 the International Center for the Study and Teaching of Mosaic (CISIM) in Ravenna, Italy, proposed to create a copy of the mosaic. When they had received approval, the mosaic master Severo Bignami and his eight-person team took a large photograph of the mosaic, made a tracing of the image with a dark marker and created a negative impression of the mosaic. The team composed the mosaic in sections in 44 clay frames, trying to preserve the pieces of the mosaic in the exact positions they are in the original mosaic. They had to keep the plates wet all the time. Then they pressed a tissue on the clay to create an image of the outlines of the mosaic in the clay. The team recreated the mosaic with about 2 million pieces of various marble types. When they had placed all the pieces, they covered the result with a layer of glue and gauze and pulled it out of the clay. They placed each section on synthetic concrete and then united the sections with the compound of glasswool and plastic. The project took 22 months and a cost equivalent to US$216,000. The copy was installed in the House of the Faun in 2005. Centre detail of the Mosaic. Detail of the Persians on the right side of the Mosaic. Detail of a fallen sword from the bottom right of the Mosaic (showing the individual tesserae). Wikimedia Commons has media related to Alexander Mosaic. ^ L'Orange and Nordhagen, Hans Peter and Per Jonas (1966). Mosaics. Great Britain. p. 8. ^ Alexander Mosaic by Dr. Beth Harris and Dr. Steven Zucker, Smarthistory, 2013. Retrieved 26 May 2013. ^ Davies, Penelope JE; et al. (2007). Janson's History of Art. New Jersey: Prentice Hall. p. 246. ISBN 978-0135006887. ^ Davies, Penelope JE; et al. (2007). Janson's History of Art. New Jersey: Prentice Hall. p. 146. ISBN 978-0135006887. ^ Wallace-Hadrill, Andrew (1994). Houses and Society in Pompeii and Herculaneum. p. 3. ^ "16.04.1956: Alexander the Great in Modern Greek Bank Note of one thousand Drachmas=". History of Macedonia. Retrieved 16 Aug 2015. ^ Alexander, Piece by Piece. by Marco Merola, Archaeology, Abstracts Vol. 59, No. 1, Jan/Feb 2006. Retrieved 26 May 2013. Archived here. Reconstructed and completed Alexander mosaic. This page was last edited on 24 April 2019, at 11:08 (UTC).